I was born in the Imagon family, and joined the company on full-time basis in 2009. Today, I am Sales Manager. 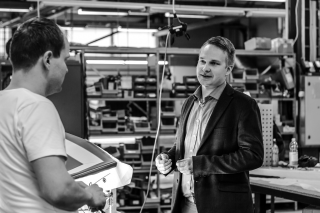 Together with the CEO and the management group we create even better, more effective and creative LED-solutions for our customers. I’m in responsible for selecting our manufacturing partners, purchasing management and product development, especially LED development. I am also a member of the company’s management group and a member of the board. I am a part owner of the Imagon Group. I am born and raised in Kajaani. I moved to Tallinn, Estonia for a six-month project in 2012. Now it feels refreshing to be back working to Imagon group. On my free time, I like all motorsports in general and fast trackcars in particular. I am a member of the organization Backwoods Customs, where car enthusiasts gather together to tune cars in the Kajaani area. At home, I have a Pyrenean Mountain Dog, Nalle and a Pyrenean Mastiff, Jesse who keeps me active.